Bacon Wrapped Bread-sticks, Caramelized Apples & Pistachios and more! Check out the recipes from today’s episode of The Chef’s Table! Take raw bacon strips and wind each strip fully around breadsticks, wrapping it from top to bottom and lay on a cookie sheet. Then sprinkle raw sugar over wrapped breadsticks and a little cayenne pepper. Bake for 15-20 minutes at 350F, until done. Remove from oven and sprinkle more sugar over toasted bacon breadsticks and set on a napkin to drain excess oil. To serve, place wedge of Brie on plate and stand breadsticks around it. Add clarified butter to hot sauté pan. Then add chicken and sauté. Sprinkle curry powder over cooking chicken and stir to coat chicken. When chicken is cooked, add to pan the onions and celery and garlic. Then add cracked pepper and red pepper and stir to combine. Push contents of sauce pan to one side of pan and in the free space, add the flour to the oil already in pan to make a roux, and then mix in with chicken and vegetables. Add chicken stock, coconut milk and heavy cream to the pan and combine. Then stir in diced apples. Combine well and let cook. Then add broccoli florets and some of the cilantro and remove from heat. To serve, pour chicken curry into serving dish and garnish with remainder of cilantro. Add butter to hot sauté pan and let melt, and then add pistachios to pan and sauté until they start getting color. Toss in apples and sugar and cook for about a minute. Add vanilla and cinnamon to pan. Then add whole butter and continue to stir to caramelize. Do not stop stirring pan contents. When butter has melted and bubbled, remove pan from heat. To serve, scoop vanilla ice cream into serving dish and pour caramelized apple and pistachio mix over top. 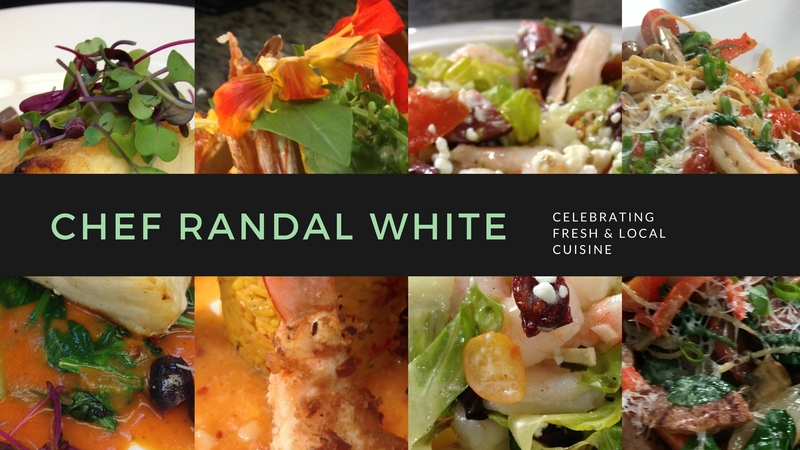 The Chef’s Table with Randal White airs Saturdays at 12 noon on Gainesville, Florida’s PBS WUFT Channel 5. Liked these recipes? Check out my new Southern Family Recipes available on Amazon!